Il New York Times di oggi pubblica 2 articoli su Mario Monti. Mr. Monti, 68, a respected economist who has promised to be a steady hand in a time of market turbulence, said he expected to move ahead as soon as he secured a parliamentary majority for the new government. 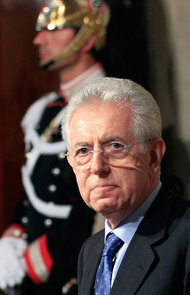 The consensus in Italy is that President Giorgio Napolitano, who nominated Mr. Monti in record time on Sunday to replace departing Prime Minister Silvio Berlusconi, had chosen judiciously, picking an economist with strong European credentials and longstanding familiarity with Europe’s power brokers. It remains to be seen, however, whether Mr. Monti — who has no hands-on political experience at home — can convince financial markets that he can overcome Italy’s snarled domestic politics and implement the cost-saving measures that Italy has promised to whittle down a mountain of debt and boost growth.